I decided to go to the cross stitch shop (Nantz Needlework and Framing) nearest my in-law's last Friday. I walked into the shop and there were a few people in there, but I didn't pay too much attention. I was walking around, looking at patterns, when I hear one of the ladies mention Swan Sampler Guild. I look over and wonder if it's Cari from Simply Fabulous Cari. I know her sister Cathy is in the guild and I know that Cari lives in the area. Sure enough it was her and we recognized each other at almost the exact same time. It was just too funny!! It was so great to finally meet her and two of her friends that were with her. They invited me to lunch with them and then to stitch at Starbucks. It was a wonderful day! I hope to meet up with Cari and her friends again in the summer. 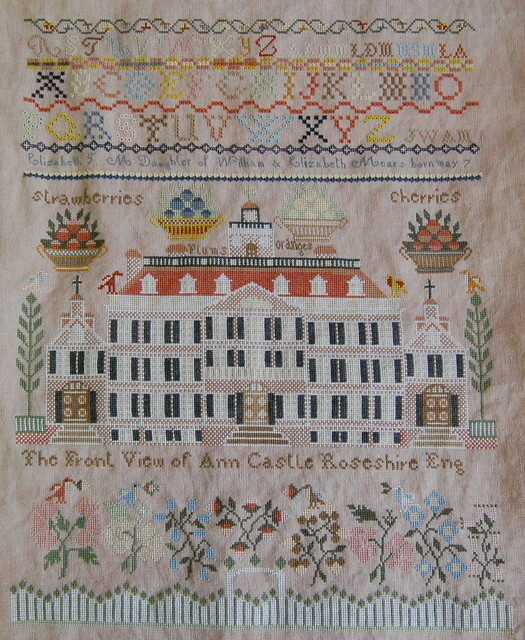 Elizabeth is coming along beautifully - what a gorgeous sampler. I'm waiting for my Loose Feathers stuff to get here from across the pond, can't wait... it always takes a while. Every time I see your Elizabeth Mears, I think to myself it's time to order the fibers for it. I think it really is time. Gorgeous!! The fibers for the BBD piece look great too! As for waking up at 6am again -- I didn't have a problem adjusting back this time. I think it's called being stressed out about one's son going to college. lolol! 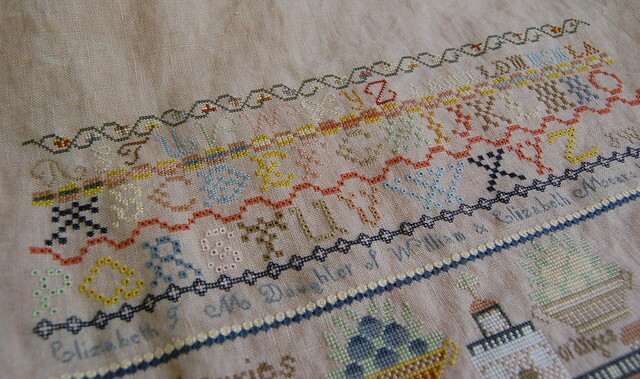 Elizabeth Mears is a stunning sampler and is coming along beautifully Nicole. I'm giving this years Loose Feathers a miss as I still have yet to start on last years! Your Elizabeth Mears is looking gorgeous! I agree, the new loose feathers are beautiful. I already started my sampler... in between others! LOL Have a great day! That is SO COOL that you met up with another stitching group!!!!! You must have been on Cloud 9!!!! Your Elizabeth Mears is beyond words!!! Getting up early and/or at a certain time everyday stinks to high heaven! I just want to get up when I want and then stitch and read. Your Elizabeth Mears is beautiful. I've had her in my stash for awhile now. I really need to get her out! You really inspire me! Your sampler progress is gorgeous! Oh gosh, your Elizabeth Mears is just gorgeous - the colours! 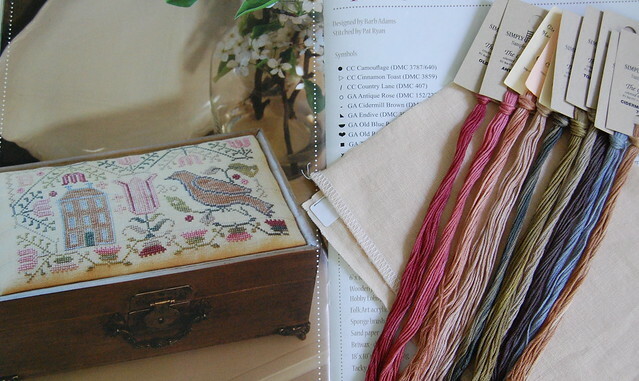 That's why I love the stitching blogs, you really get to see a design properly! I'm waiting for the new Loose Feathers as well! Elizabeth M. is gorgeous! I'd love to have her framed and hanging on my wall, but I know I'd never get the huge building stitched. Love the BBD piece... the fiber colors are wonderful. Thanks for the nice comment about the BBD box I'm working on. I just love it and hope to have a finish in the next few days. Nicole, your "Elizabeth" is beautiful...such an accomplishment! Love the eyelet alphabet. Glad you had a fun visit in Florida...lunch and stitching at Starbucks...what could be better?! How fun to meet fellow bloggers in person!!! You piece is amazing! Great progress on your sampler. It is always great when you get to meet up with fellow stitchers. I'm still on the fence about the BBD designs booklet, maybe in October. Amazing. Can't wait to see this framed. Miss Elizabeth just gets more and more wonderful each time we see her. Elizabeth is beautiful, you have made great progress! The new Loose Feathers has such lovely colors! Dont you LOVE the latest Loose Feathers? How fun that you got to meet Fabulous Cari, and I bet she feels the same toward you. Elizabeth is just so pretty. Can't wait to see your start on Spring Song. The threads looks yummylicious! Elizabeth is looking great. It sounds like you had a nice spring break. The new BBD is so pretty. Beautiful work Nicole! Glad you had a nice vacation and how neat that you ran into blog-friends! Sounds like a perfect day! I am so excited to you got to spend the afternoon with Cari and her friends. That's just too much fun :-). Love Elizabeth and the BBD Loose Feather, the whole chart is wonderful. Your Elizabeth is gorgeous. It looks like you will be done soon. Isn't Cari the best? How great that you got to go to lunch with her and her friends. Something to look forward to on future trips! Love the new start. That is a beautiful box. Elizabeth is coming along nicely! I'm glad you had a good visit. So glad your visit back here was a good one. Elizaeth is awesome! OMG Elizabeth Mears is looking fantastic!! You are making great progress. How fun to meet Cari by chance - it sounds like a wonderful day. Welcome home! Sounds like you had a great day with your fellow stitchers, I am so glad. Nothing beats a day stitching with friends, don't you think? What a lovely coincidence to run into Cari like that. Elizabeth sure is a stunner! Love that BBD as well!